Today’s recipe is Masala Baby Potato fry and this recipe is our special back pocket resident favourite!It’s made when we have guests , when we want to celebrate, when we want to sulk, when we want to carb load.Lol.Basically our goto Indian Vegetarian recipe. According to me, We Indians are the Aloo People..Not the Aam Aadmi as people think..Aam is available only for 3 months at best..but we indian adore our potatoes!I knew kids in school who survived their first 15 years(and some beyond!) on only Potatoes! Even the most fussiest eaters could be enticed into eating potatoes. Baby potatoes are small thumb sized potatoes harvested way before they mature into bigger/Larger Potatoes.I love these cute cuddly little potatoes and make them often in a number of ways.Our favourite baby potato dish is these Masala Baby Potato Fry and Italian Olive oil Herb Potatoes, which I usually serve at our gatherings. Alternative – If you can’t find baby potatoes- use normal potatoes and quarter them to make the same Roast potatoes.If for some reason you don’t want to use potatoes, you can make the same dish with Arbi or Yam instead too. Because this dish uses very minimal ingredients it ticks off on many restrictive diets.It’s vegan and hence vegetarian.It’s also paleo and whole30 approved.As per our indian customs- it is also Vrat approved- if you use sendha Namak. 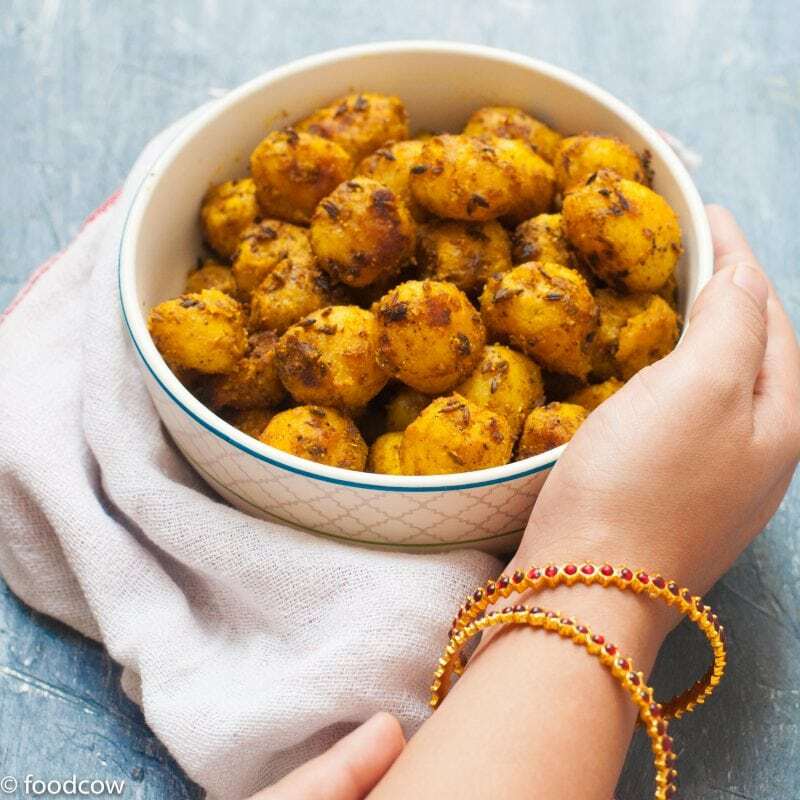 For this recipe of Masala Baby Potato Fry – Potatoes are roasted in dry masalas.There is no cutting, chopping or gravy making involved.They are pretty straight forward if you read the recipe.Though if you have any doubts, please leave me a comment below. Heat 1 tbsp oil in a pan.Add the potatoes.Saute and cook till they start turning golden brown. Make a small space in the middle of the pan.Add the left over 1 tbsp oil. Once hot, add the jeera, coriander powder, chilli powder and turmeric.Roast for 15 seconds(keep an eye as it burns easily).Add salt as per taste. Mix with the potatoes till they are well coated.Cook for another 2-3 minutes. Before you go, I have some more amazing Vegetarian recipes for you! !